This article talks about worship, holy spirit, wisdom, work, attitudes, understanding. A rather wise thing to ask for, you may think! The Lord replied that because Solomon did not request the things the world might consider to be desirable, he would be granted the request, and would be given “a wise and discerning heart”. In addition, he would also be given a wealth and honour that was far superior to any other earthly King. I’ve been asking myself the following questions recently: Where does wisdom come from? How can we become more wise? Is there a difference between earthly wisdom and Godly wisdom? Perhaps like Einstien some of us may think that wisdom comes not from schooling but from the lifelong attempt to acquire it. Put another way, wisdom may well come from learning from the mistakes that we make along life's path. I’m sure that both of these statements are spot on. However, something doesn’t feel right to me, this attitude alone just seems slightly too worldly. “Our decisions should be made from the perspective of lives lived for God and not just for our own enjoyment. 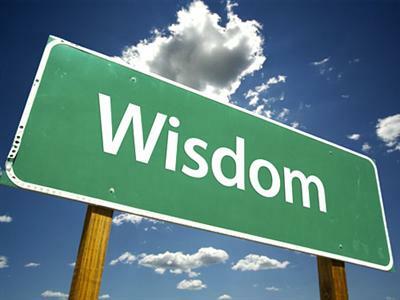 So it seems to me that a fair amount of wisdom can be obtained or learnt on a human level, and indeed, arguable some non-christians appear to be more wise than some christians (although we must not confuse understanding and experience for wisdom). However, there seems to be another level of wisdom, that, as Costa states, is grown within us by the inspiration of the Holy Spirit, when our lives and the decisions that we make are centered around God and are lived as acts of worship.